Some people are just too easy to satirise, because they do it all by themselves so much better. Donald Trump is a perfect example. 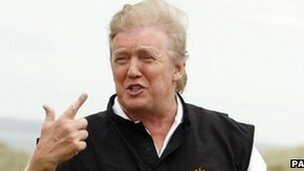 Trump, with his ridiculous hair, massive ego and outrageously enlarged sense of entitlement, is so obviously ripe for satire that it hardly seems worth doing. Remember how Trump first got permission to build his golf course in Scotland riding roughshod over objections that it would be destroying an area of outstanding Scottish beauty? And then how he went on to object himself to a wind farm project near the same golf course because ……. it would be destroying an area of outstanding Scottish beauty? Shameless hypocrisy and lack of self-awareness of that kind is hard to satirise. I don’t like Donald Trump. I never have. To me, he’s not just an annoying rich kid, another talentless, overhyped reality TV show star. He’s the perfect example of a society based on plutocracy – where the simple fact of being rich gives someone the right to be in charge – rather than a society where everyone has equal rights and success is based on merit. It annoys me immensely that someone who managed to make millions by being born into millions is held up by so many people to be such an expert on business acumen. FFS, he’s the only business person in history who has actually managed to LOSE money owning a casino. Three times. Because Donald Trump owes all of his success to the fact that he possessed just one important quality – the one thing a business person really needs to succeed in today’s cut-throat business environment. What bothers me is that the same sort of ‘self-important, conceited, supercilious, presumptuous, jumped-up pricks’ are the so-called much lauded philanthropists. I mean would you really want someone like Donald deciding what causes/people are deserving? no objections…but would like to add hypocritical to your list. It galls me that these elite rich shits talk about and punish the ‘undeserving poor’ when to them work usually consists of buying someone to move around vast sums of inherited cash so that they have even more profit at the worlds expense, and then believe that somehow they are better, cleverer , more deserving human beings. Spot on Tom! I loathe the conceited blighter too and I’m definitely not jealous of him, his millions or his hair…..I’ve got ok hair and I get by with my finances even though I’m a retired health worker with an ever decreasing pension! My dad was a man in a million and he would be rotating in his grave like a whirling Dervish if he could see what these arogant, greedy, rich so-called business inovators are doing to the country he loved and indirectly to the family he loved. My dad, also a keen golfer, had nothing much in the way of finance or property but he never hankered after anything and was satisfied with a job and a decent family life….aaagh! Thanks for your great stories! Why can’t this sleazy government understand that the rich should pay all their taxes, like the rest of us, and then they could decide what causes to fund….that’s the job of the gvmt. after all, isn’t it? Patricia – I totally agree. The rich should pay their taxes and then government would have enough money to properly provide for those who are vulnerable… and perhaps they wouldn’t have been vulnerable in the first place if there were not rich elites using their inherited wealth to create financial mayhem in pursuit of still more money (as Geraldine below says:) ).